Ratchet+Wrench featured our customer, 405 Auto, in its June 2015 issue. A BOLT ON customer since January 2013, 405 Auto is a power user of our Mobile Manager Pro auto repair software and our Welcome Station kiosk. In the article, the magazine dubbed 405 Auto a ‘Shop of Tomorrow’ for its heavy use of technology, both for tablet-toting technicians working in the bays; and at the front counter where customers are encouraged to use our automotive kiosk to check in for service. Technology advancements have paid off for 405 Auto. In 2014, the shop generated $1.4 million in revenue and a more than $1,400 average repair order, according to the Ratchet+Wrench article. A cornerstone to improved customer confidence – and simplified shop processes – is the use of our tablet-powered customer check in kiosk. 405 Auto Owner Martin Kruszelnicki told us that our technology helped the shop become completely paper-free, in large part due to the interactive kiosk, which greets customers, asks them to update their contact and vehicle information and suggests both recommended and weather-related services. Instead of long lines of customers waiting for front desk staff to check them in, Kruszelnicki said customers now spend 30 seconds checking in for appointments and drop-in service calls. Going green also earned 405 Auto recognition in Santa Monica, California’s Sustainable Quality Awards. 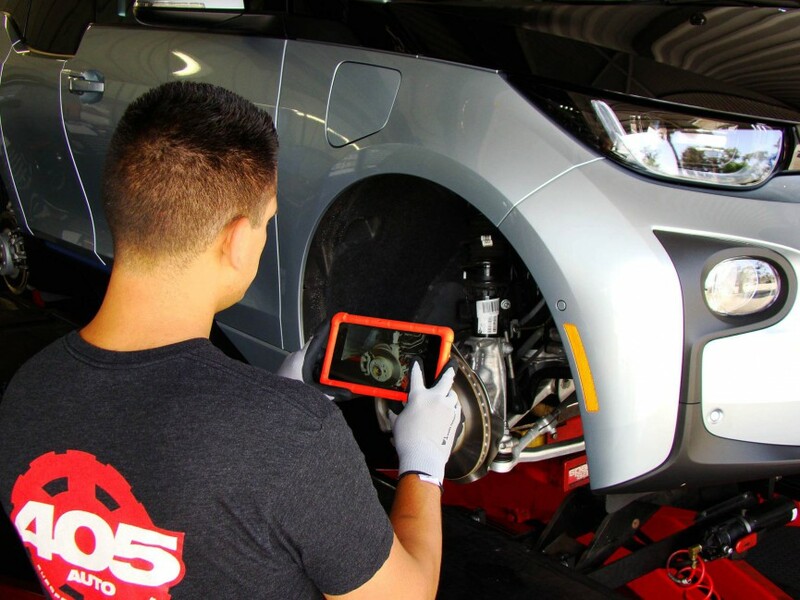 To simplify technicians’ workflow, 405 Auto uses our Mobile Manager Pro digital multi-point inspection tool. Techs use the tool to carry out inspections on every vehicle and to take vehicle condition photos. Inspection reports and photos are sent via email or text message to customers. A time-saving plus of all of our auto repair software solutions is that it transmits automatically into the shop management system, eliminating the need for re-entry of information. Read the full article here: The Shop of Tomorrow.